ONLINE – Lutheran Church–Canada (LCC) has released the 2017 edition of its annual Mission Newsletter. 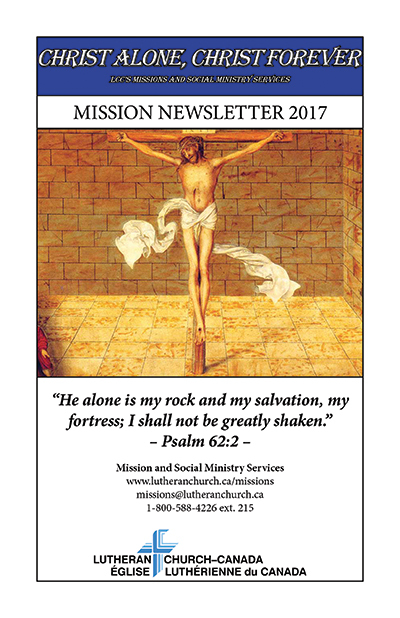 “The 2017 Mission Newsletter presents just a few snapshots of what the Lord Jesus has accomplished in the lives of people through the missions and social ministry of Lutheran Church–Canada this year—how communities have been graced by His love and mercy,” explains Rev. Dr. Leonardo Neitzel in the introduction to this year’s newsletter. Dr. Neitzel is LCC’s Executive for Missions and Social Ministry. The 2017 newsletter reflects on LCC’s work afield in Ukraine, East Asia (Thailand and Cambodia), and Central America (Nicaragua, Costa Rica, and Honduras). Stories and projects explored include: the reorganization of the church in Cambodia following more than a year of internal administrative problems; the training of three new missionary candidates for the Phang Nga Province in Thailand; the provision of relief in Ukraine for refugees fleeing unrest in the eastern part of that country; new ministry outreach opportunities in Honduras; Reformation celebrations in Costa Rica; the expansion of youth gatherings in Nicaragua; and much more. Download this high-quality pdf of the newsletter and print it off at home. (Be sure to select “booklet” in your printing options.) Alternately, if you just want to view the newsletter on your computer, you can download this web-friendly pdf.